I am getting pretty excited about the sci-fi films being released in 2009. I know--I am such a geek! Here's another T4: Salvation trailer (actually a better one than the first), but it's not embeddable. In honor of Mother's Day and my own lovely mum, here's Star Wars According to a 3-Year Old--proof that sometimes being a mom is worth it for moments like these. Here's the 2 min. version. Here's the 2 min. version interspliced with clips from the movie. The 7th Annual Ashland Independent Film Festival is underway! Don't miss what LA Weekly calls the "almost-perfect blend of programming, audience and location." You can still purchase tickets online for films at the AIFF Web site. You can also go to the box office at the art-deco Varsity Theatre on Main Street. There's a lot going on, although, alas, no official Bruce Campbell screenings or events. Besides the films and the late-night discussions at The Black Sheep, the official after-lounge of the AIFF, tonight at the Awards dinner, the 2008 AIFF Lifetime Achievement Award will be presented to "the dean of documentary filmmakers" Albert Maysles. He will bring his classic documentaries Gimme Shelter, Grey Gardens, and his new film The Gates to the festival this year. (I saw The Gates when I lived in NYC and it was amazing.) Academy Award Winner Helen Hunt showed her directoral debut Then She Found Me yesterday and will receive the 2008 AIFF Rogue Award. Widely known as one of the best small indie film festivals in the country, the AIFF recently received a prestigious grant from the Academy Award of Motion Picture Arts and Sciences. It was the only festival in the Northwest and only one of twenty in the U.S. to receive one. I was on the advisory board of the festival this year. I would have liked to have done a lot more, but I did manage to do a couple of things, including donating my own money and bringing Musician's Friend on as a local sponsor for the first time. And just my luck, I have been fighting a nasty Spring cold for a week and am still sick--not good for being in a theatre or anything else for that matter. I had hoped to make it to the event tonight but it's not looking good. I am a huge film buff, although from my blog you probably wouldn't know it. My film posts are admittedly very few and far between. I'll try to rectify that a bit in the new year. In any case, these were the Top 10 films I saw in 2007 (most released in 2007...only a couple a bit older than that). It was a pretty good film year. Even movies I thought were overrated (e.g. Waitress), were still pretty acceptable, all things considered. No Country for Old Men: The Coen Brothers do it again. Zodiac: Engaging crime procedural that still satisfies as an unsettling thriller. Must have been released early in the year--it kind of got lost in the shuffle. 4 Months, 3 Weeks & 2 Days: Grim Romanian film about illegal abortion. Winner of the top prize at Cannes in 2007. Ratatouille: Loved it--cartoon or not. And if you've got more time to fritter away, check out my picks for Best Albums and Songs of 2007! I was lucky to have a family that loved foreign films. Jean-Jacques Beineix's Diva was one of the movies I saw when I was quite young, about 9 or 10. We used to go to the Little Art Theatre in Yellow Springs, Ohio and I'd always get a delicious homemade chocolate chip bar and mint tea. 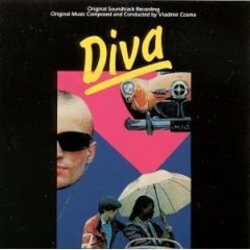 I saw many '80s indie classics there before I left home at 14 to go away to school--from After Hours to Tampopo to Sugar Baby--but none I loved more than Diva with its opera, car chases, and French New Wave cool. Entertainment Weekly writer Lisa Schwarzbaum's lovingly sentimental review of Diva's 25th anniversary rerelease captures exactly how I feel about this film which is not only one of my all-time favorites, but it even started a new style of French filmmaking called the cinéma du look. Don't miss seeing Diva on the big screen. Here's the tour schedule to check if it's coming to your town. Jeff and I are having a quiet Sunday dinner tonight at Chateaulin, a French bistro in Ashland (good food and owned by a New Yorker, of course), when I hear him yell an enthusiastic hello across the room to a guy sitting at a table alone. The man comes over and shakes our hands while Jeff introduces me. "I'm sorry...who are you again?" I say dumbly, thinking this was just another friend of Jeff's. 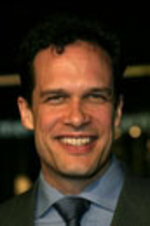 Nope, turns out this is Diedrich Bader, Oswald from "The Drew Carey Show" and Napoleon Dynamite. I was really impressed that Jeff knew his name, but anyway, Diedrich was super friendly and he has done some great work over the years. Diedrich's in town shooting a baseball film called Calvin Marshall that will be out next year. The movie's being shot in Ashland and Medford and brings Gary and Anne Lundgren of Broken Sky Films back to the Rogue Valley where they shot the award-winning short "Wow and Flutter." Here's the article about Calvin Marshall that was in today's paper. I recently recorded a 45-minute documentary on the Sundance Channel called Air Guitar in Oulo. It focuses on one (odd) Canadian's journey to the World Air Guitar Championships in Oulo, Finland. I found it both fascinating and painful, mostly because the guy seemed lonely and completely misunderstood, but I have to admit the movie stuck with me. Last week, I was going to buy additional tickets to the Ashland Independent Film Festival (beyond the world premiere of Bruce Campbell's newest, My Name Is Bruce) and noticed Air Guitar Nation was showing on Saturday night. I thought it was the same movie I'd already seen, but, no, it is actually a new film about air guitar which chronicles the birth of the US Air Guitar Championships. Funnily enough, Air Guitar Nation is distributed by New Video, the same company that produces and distributes the DVDs I used to market at A&E and The History Channel. I spent quite a bit of time with them over the years, especially early on in my A&E career when I focused a lot of energy marketing The Avengers releases in the US. Kudos to Susan and Steve--this is their first foray into theatrical releases and I'm sure it'll be a success. Small world. Anyway, fans have a chance to rock themselves into a featured role on the Air Guitar Nation DVD. Through June 1, you can submit photos of yourself playing air guitar and the winner will be on the DVD extras and win a trip for two to the US Air Guitar finals in NYC this summer. The top 10 finalists will be featured at http://www.AirGuitarNation.com. If you have no idea what air guitar even is (or just want to be amused for a couple minutes), check out this video. If you want to be really cool and play a real guitar, visit GuitarCenter.com or MusiciansFriend.com! The 6th Annual Ashland Independent Film Festival will be held in Ashland, Oregon from April 12-16, 2007. Over 90 documentary, feature and short films will be shown, including four that were nominated for Academy Awards this year. Here's a list of all of the films. Click here for the film schedule. 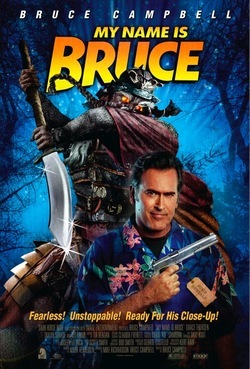 The highlight of the festival for me is going to be the sneak preview on Friday the 13th of Bruce Campbell's new movie, My Name Is Bruce, in which a small Oregon town, plagued by the Chinese God of War, kidnaps a B-Movie actor (guess who) to help them defeat it. The movie was shot and produced in Ashland, White City, and the surrounding Southern Oregon area. 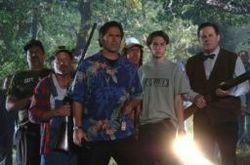 In honor of this world premiere screening, the Festival is showing other Bruce Campbell cult movie classics that same day, including Bubba Ho-Tep and my personal favorite, Evil Dead II.